Stray dogs have taken over a lot behind Banglamung Hospital, raising fears of attacks and rabies infections among neighbors. The lot on Naklua Soi 13 serves as a parking lot for the hospital, but now is infested with dogs and covered in feces. Neighbor Pratuan Yodket, 55, said people repeatedly had left dogs on the land, swelling the canine population. The animals have been a nuisance to local residents and hospital patients, causing motorbikes to crash and the occasional person getting bit. 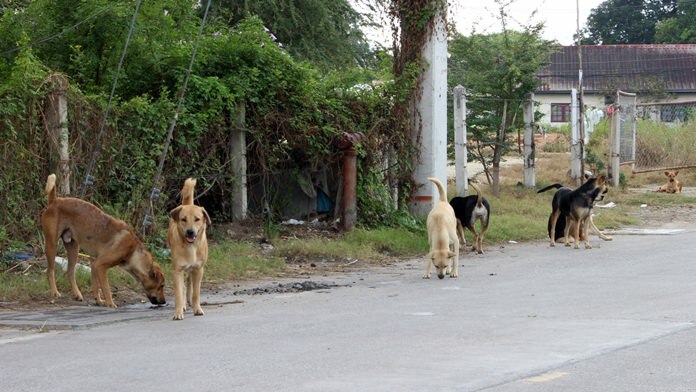 With Chonburi declared a “red zone” for rabies infections – with three fatalities this year so far – neighbors want the local government to round up and clear out the dogs.